To check it out, just visit news.google.com from the mobile versions of either Chrome or Safari. If you don’t see the new version yet, below are two screenshots of what you can expect. 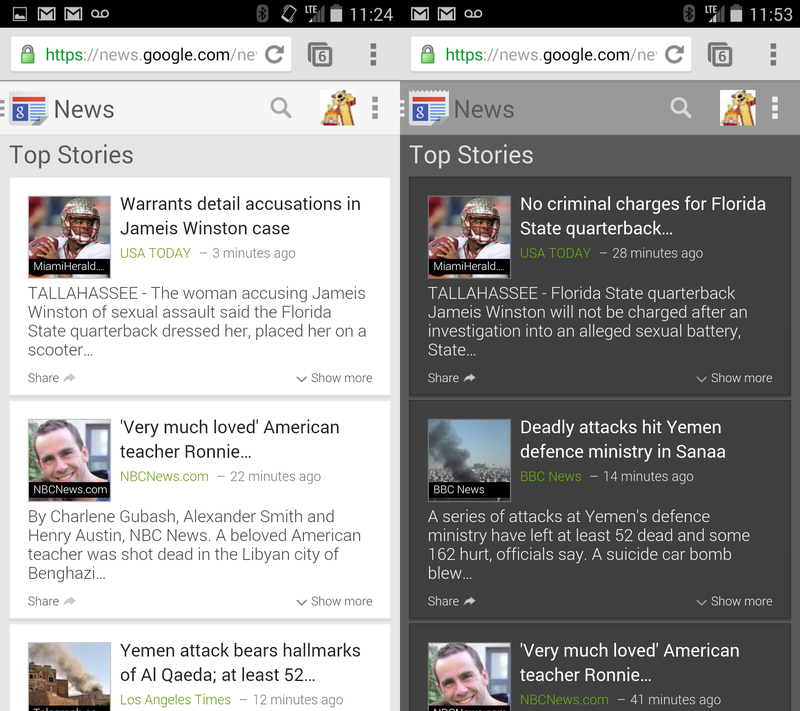 Improved overall look-and-feel making it easier to read and track separate stories. Ability to customize the Web app to suit your taste by changing the theme from light to dark (as you can see above), the font size and opting for a larger “story card” with more information per story at your fingertips (from the Settings menu, at top right). Simplified navigation to any section within News; just click on the Google News icon (top left) to see a list of available sections (including any custom sections you created). Easier integration with Google Feedback located in the menu at the top right. Google also says it has brought over features from the desktop version of Google News, including a weather gadget in the Local section and the popular “Editors Picks” option. Unfortunately, social posts from Google+ related to the story are also now included in the article cluster. If Google is ready to push out the new site on the US version already, not much will be changed or added for quite some time. It’s unfortunate Google won’t say when these new mobile features will come to other Google News regions; they probably won’t be ready till next year.